or design custom stockings from scratch based on your specifications. Please scroll down below the photos for information on pricing, sizing, and other details. See more custom Christmas stockings with Angel Pictures. They can be done with several colors, but a single color is typically most effective. See more custom Christmas stockings with Animal Pictures. See more custom Christmas stockings with Candy Cane Pictures. Candy canes can have a very striking effect on either a green or a white background. See more custom Christmas stockings with Christmas Tree Pictures. The Christmas tree shape is ideally suited for knitting. A Christmas tree looks good on white, blue, or red backgrounds. See more custom Christmas stockings with Different Pictures. An infinite variety of combinations are possible, of course. By combining different pictures you can create a completely unique stocking. 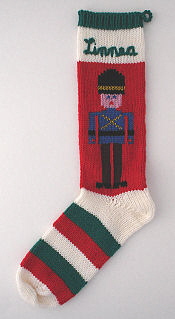 See more custom Christmas stockings with Nutcracker Pictures. These can also be seen as toy soldiers. Nutcrackers are closely linked to Christmas, however, thanks to the famous ballet. See more custom Christmas stockings with Reindeer Pictures. Reindeer can work well in either light or dark brown, depending on the background. See more custom Christmas stockings with Santa Claus Pictures. Santa is best on a green or blue background, since red and white are both part of his classic look. See more custom Christmas stockings with Snowflake Pictures. Snowflakes are very versatile with regard to shape and size -- they can be tiny accents, or large central motifs. 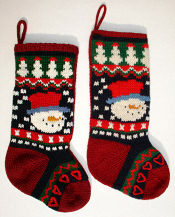 See more custom Christmas stockings with Snowman Pictures. There are many snowman pictures around, some very simple and some quite complex. See more custom Christmas stockings with Toy Pictures. Many toys can be done in classic colors, or a wide variety of colors can add interest. See more custom Christmas stockings Without Pictures. These stockings can be smooth, or textured patterns can be worked into them. 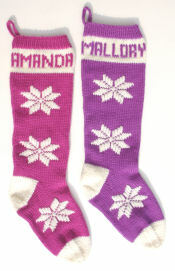 I can knit Personalized Christmas Stockings in almost any colors. Traditional Christmas colors are always popular, but other combinations work well too. I price custom stockings based primarily on design complexity, which affects the time spent knitting and finishing. I usually use either acrylic or wool for the main yarn. Acrylic is safe from fiber-eating insects, and can be machine washed and dried if there are no other fibers or embellishments in the stocking. The acrylic that I use has very intense, jewel-tone colors. Wool is more traditional and has a higher-quality feel to it. However, it must be hand washed only, and may need protection from certain insects. The colors are typically softer and more natural or "old-fashioned" in look. My stocking prices begin at $30 for a 12" personalized Christmas stocking with 2 colors and a name. The picture stockings, which seem to be the most popular, currently start at $95. However, on Jan. 1, 2017, that base price will increase to $105. (This is my first price increase since January 2013.) I've put together a list of extras and what I charge for each, so that I can come up with an exact quote for a particular design more quickly and easily. The list (see below) also specifies what's included in the base price. You can use this list to get a pretty good idea what your desired stocking will cost. Once I determine the details of your order, I can give you an exact quote for your custom Christmas stockings. As with other custom orders, I ask for a 50% deposit in advance, with the balance due upon completion. There is no such thing as a "standard" size for Christmas stockings! They can range from 1" (tree ornaments) to 48" or more (door decorations). The type that is typically hung on a mantel to hold small gifts usually ranges between 9" and 25" long. 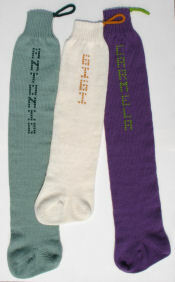 The size of a knitted stocking depends on three different factors: (1) the pattern, which is written for a particular number of stitches and rows; (2) the yarn used (for any given pattern, a thicker yarn will create a larger stocking than a thinner one); (3) the tension used by the knitter (for any given yarn and pattern, tighter knitting will give a smaller stocking than looser knitting). These three factors can be modified to a certain extent. A knitter can usually add or subtract a few stitches and rows to a given pattern, but at a certain point the design will be compromised. Slight adjustments can be made to the tension, but a stocking knitted too loosely will not hold up well and one knitted too tightly will be stiff and have limited stretch. The easiest way to affect the size of the stocking is by yarn choice, since yarn is available in a wide variety of thicknesses. If you're interested in a custom stocking, but want a particular size (perhaps to match existing family stockings), please let me know your concerns early in our planning process. I will need time to make the required adjustments, which may include re-charting the pattern, choosing a different yarn, possibly ordering and then waiting to receive the yarn, or knitting sample squares so that I can better estimate the finished size of the stocking. The bottom line is that I can't guarantee an exact size, but I will make every effort to match the size that you request. I should be able to come close. However, the nature of knitting is such that it's difficult to take precise measurements, and the gauge of a sample square provides only an estimate of the finished size. Please also bear in mind that stockings stretch over years of use, and a new stocking knit from the same pattern as an old stocking may start out shorter! 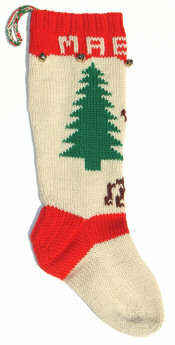 In most older, hand knit Christmas stockings, the names are actually knitted in as part of the original fabric. I rarely use this method since it often leaves loops or "floats" on the back side of the fabric. These floats are easily caught on fingers when gifts are put into the stocking. When they're caught and pulled, the result is much like a snag on a sweater. The fabric and design are distorted, and if the pulled loop is cut or broken the fabric will begin to unravel. I prefer to add the name by hand after knitting is completed. I use a technique called "duplicate stitch", where the added stitches follow the yarn path in the underlying knitted fabric. This results in the name looking knitted-in, although it is slightly raised since it's added on top of the underlying fabric. I use this same technique for some of the smaller color areas in the main pattern (for example, Santa's eyes and mouth). There are some names that can't be added this way. 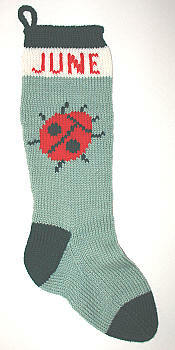 They're simply too long to fit onto the available knitted stitches when duplicate stitch is used. In some cases I've used a nickname, or initials instead. Another option is to use the full name, but to embroider it in backstitch. The two photos below show the difference: NATHAN is in duplicate stitch, and TRENTON is in backstitch.